As a matter of policy, Ikeja Electric Plc. maintains a culture of zero-tolerance to all illegal and unethical practices across its operations and distribution network. 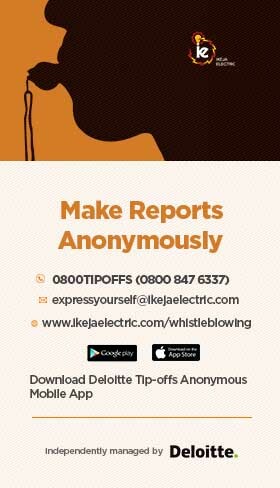 Our Whistleblowing Policy and Guidelines allows for the transparent and timely reporting of all unethical activities you are aware of. We have engaged Deloitte, an internationally acclaimed whistleblowing service provider to independently manage the process. The whistleblowing channels are accessible 24-hours a day, 7 days a week, so now, you can report all illegal and unethical activities in a safe, confidential, secure and anonymous manner. Report anyone who fails to report any of the above listed acts despite knowing. …Or simply click HERE to submit a report online.